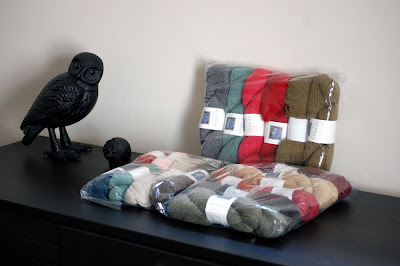 I received this big box of loveliness mere minutes ago: So many beautiful skeins of delicious Sunday Knits yarns. Thank you so much, Carol! Time to get to work. In a scant few weeks I'm fixing to be Miss October. More details on that soon. September 7, 2010 at 12:38 p.m.
see if you can design french bulldog mittens. i would def buy them. September 7, 2010 at 12:42 p.m.
Can't wait to see what you do! September 7, 2010 at 12:51 p.m. I'm excited to see what you come up with! September 7, 2010 at 1:36 p.m.
September 7, 2010 at 3:57 p.m.
socks with pints? It's hot here and a really cool pint would be great. September 7, 2010 at 4:02 p.m. I want to be you. For a day. And receive yarn! September 7, 2010 at 7:55 p.m. I did NaKniMitMo last winter and will join in again. Still love your Anna mitten design and can't wait to see what you come up with this year! September 8, 2010 at 9:24 a.m.
September 8, 2010 at 11:17 a.m.
You're so welcome. It couldn't be in better hands! September 8, 2010 at 2:27 p.m.
Buy some, get some sale --> one more day! It's a Sale: buy some, get some - free!